In a nutshell, the final budget represents a substantial cut compared to the previous year (FY12) and compared to what was approved by Congress. The final budget approximately splits the difference between the Administration’s proposed budget and Congress’ approved budgets. Space Policy Online does not provide any detail on spending within the Planetary Science program. Important details would be the level of funding for the Discovery and New Frontiers programs, which would indicate when the selection of the next missions in the programs could begin. We also don’t know at what level studies of a future Europa mission are funded. The MAVEN Mars orbiter is set to launch in November or early December. Once it reaches Mars, it will return data that scientists will use to explore the composition and dynamics of the upper atmosphere where air meets space. A key goal will be to better understand the processes that likely lead to the loss of the Red Planet's likely much thicker early atmosphere. Aviation Week and Space Technology has an excellent article describing the mission and its science here. The concept is new enough that there’s not even a consensus on what to call the spacecraft – SmallSats, micro-satellites, tiny spacecraft. Traditional spacecraft – let’s call them LargeSats – weigh hundreds of kilograms and cost hundreds of millions of dollars. At the other end of the spectrum, CubeSats are based on the electronics that have enabled phones to be respectable computers, entertainment centers, and cameras. The smallest form factor for CubeSats is just 10 × 10 × 10 centimeters, weighs approximately a kilogram, and can cost as little as $60,000 to build. Large CubeSats expand the length to 60 centimeters and the mass to approximately 6 kg. An emerging class of spacecraft – I’ll call them SmallSats – would fit between LargeSats and CubeSats. These spacecraft make use of the design techniques of CubeSats but scale the form factor up to a meter or so and the mass up to 50 to 100 kg or so. At this size, the spacecraft could meet the challenges of interplanetary missions. At the Low Cost Planetary Mission conference last June, several concepts for SmallSat planetary spacecraft were presented. I’ll use the concepts presented to explore the potential and limitations of this class of spacecraft for future planetary exploration. Engineers from JPL presented their concept for one class of these spacecraft, the Micro Surveyor, for missions in the inner solar system. While the first planetary SmallSat may cost around $40M, their goal is to create a design for spacecraft in the $20M range to enable total mission costs to eventually be around $100M (compared to $450 to $500M for NASA’s Discovery missions and $750M to $1B for New Frontiers missions). Conceptual design for JPL’s Micro Surveyor planetary spacecraft that would stand just 0.9 m high. The design is sized to fit within the space allocated for secondary payloads adapter ring (ESPA) on the launch of larger spacecraft (insert figure in the upper right). Propulsion would be provided by an electric propulsion system (EP). Credit: JPL. The flight times to Venus or Mars illustrate one of the limitations that this approach has. While LargeSat missions to these planets can arrive in less than a year (thanks to a dedicated launch that puts the spacecraft on a direct trajectory), a Micro Surveyor spacecraft would take ~16 months to reach Venus and ~36 months to reach Mars. Once the spacecraft reaches its target world, the electric propulsion system would allow a slow spiral into the science orbit. Patience may be a virtue, but the longer flight times mean that mission operation costs will build up during the longer flights. The small size of the spacecraft also would limit the scientific payload. While a LargeSat Discovery mission might have 50 kilograms or more in instruments, the Micro Surveyor spacecraft is being designed to carry just 15 kg of instruments. The mission planned for the Micro Surveyor would also need to fit within the limited power available to the instruments and the restricted bandwidth of data the tiny spacecraft could return to Earth. A Micro Surveyor could, for example, carry a camera to Mars for high resolution imaging (3 to 5 m) of the surface, but the mission would be severely limited in how many images could be returned per day. Also, Venus, the moon, Mars, and near Earth asteroids have been (or are planned to be) visited by many spacecraft. Much of the low hanging fruit in terms of science has been done. With an estimated cost of ~$100M per Micro Surveyor missions, finding a new, compelling scientific missions that fit within the mass, power, and data limitations of the spacecraft may prove to be a challenge. 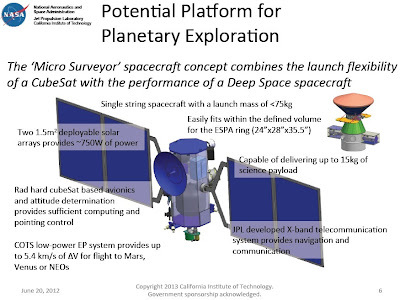 At the conference, the JPL presenter did not suggest any specific mission concepts for the Micro Surveyor. I’ll suggest three possible mission concepts that occurred to me that might meet the goals of conducting interesting new science while fitting into the mass, power, and data constraints. I want to emphasize that this is amateur armchair mission architecture; none of these concepts may pass technical muster when examined by real mission architects. The first concept would target Venus. The clouds of Venus have made observation of the surface difficult by orbiting spacecraft. While larger missions can carry heavy and power hungry radar systems to image the surface, mapping the surface composition has been largely impossible because the clouds block the view. A series of spectral windows in the near-infrared (between 0.8 and 1.8 μm), however, allow observation of the surface. 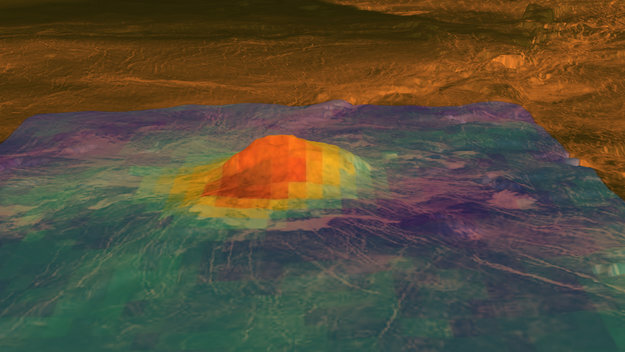 The VIRTIS instrument on the Venus Express spacecraft has mapped portions of the planet using these windows to examine surface areas for different compositions and look for temperature differences suggesting volcanic activity. Red-orange colors in this VIRTIS image of Venus’ Idunn Mons volcanic peak indicate warmer areas suggesting different surface compositions and younger ages than surrounding material. Press release describing the science available here and image caption here. Credit: ESA. The VIRTIS instrument, however, was designed for analyzing the cloud deck, and has low resolution (~150 kilometers) and isn’t optimized for observations at the wavelengths of the spectral windows. A follow on instrument optimized for surface mapping (along with further cloud studies) has been proposed for future European Venus missions. The proposed Venus emissivity mapper would weigh just five kilograms, easily fitting within the mass constraints of a Micro Surveyor mission. (In fact, on a dedicated mission, a more capable instrument might be flown than has been proposed.) Fitting within the data constraints of a SmallSat mission, though, might require creative mixing of low resolution global mapping with targeted higher resolution mapping for priority targets. A second concept would explore the diversity of comets. Visits of several comets by spacecraft have shown that these relics from the formation of the solar system are widely varied. The spacecraft that made the observations to date carried different sets of instruments, making systematic comparisons difficult. One NASA Discovery mission, CONTOUR, planned to address this problem by visiting two or more comets with the same spacecraft and instrument suite. Unfortunately, the CONTOUR mission failed early in its mission while leaving Earth orbit. The CONTOUR spacecraft carried a diverse suite of instruments: a remote imager/spectrograph (12.0 kg), an aft imager for post encounter images (1.8 kg), a mass spectrometer (9.3 kg), and a dust analyzer (11 kg). Based on these masses, a Micro Surveyor comet mission could carry any one of the three larger instruments plus the equivalent of the aft imager. (Because more than a decade has passed since CONTOUR’s launch, new versions of these instruments could be developed that would have less mass. However, the small budgets foreseen for SmallSats probably would allow for only minimal tweaking of current instrument designs. The soon-to-be-launched lunar LADEE mass spectrometer derived from the CONTOUR instrument, for example, is 11.3 kg. Budgeting something around 10 kg for a SmallSat-scale mission mass spectrometer seems reasonable.) The limited payload available for a SmallSat means that their science goals must be tightly focused. A tweak on the comet mission concept would be to send a spacecraft to pass by one of the main belt asteroids that have been observed to emit gasses like comets, suggesting that they are either captured comets or very volatile rich asteroids (at which point, there may not be much of a difference). At the same conference, researchers presented a concept for an outer solar system SmallSat mission. This work was done to investigate the power requirements for such a mission to determine whether a small version of a radioisotope power system could meet the electric power requirements. To gauge the spacecraft and power system, the team investigated a flyby of one or more Centaur objects, which have orbits within those of the outer planets. The study team selected just two instruments, a narrow angle camera (2.4 kg) a hyperspectral infrared spectrometer (4 kg). As a baseline, the study team looked at two SmallSat-scale spacecraft encountering the asteroid 2060 Chiron and a second pair encountering a second asteroid. To reach the outer solar system, the mission would have a dedicated launch that would send the four craft two Jupiter where gravity assists would redirect the spacecraft to their final destinations. Conceptual design for an outer solar system SmallSat spacecraft that would be 1.76 m high. Multiple copies of this design could be launched together (insert) to provide redundancy or allow targeting of multiple destinations. Credit: NASA, JPL. The Centaur mission again shows the limitations of small payload masses. Chiron has active gas emissions. Being able to include a mass spectrometer to measure the composition of those gasses could greatly enrich our understanding of the formation of the outer solar system. This is especially true if Centaurs were once Kuiper-Belt worlds that were later captured within the outer solar system. The Centaur mission presentation brought up interesting questions on how to think about these missions. Traditional planetary missions have sized a single spacecraft to carry all the instruments necessary to meet the science goals. SmallSat-scale spacecraft are cheap enough each ($10M to$20M was mentioned at the conference) that perhaps you fly two or more to a single target. For a comet or Centaur mission, perhaps one craft carries a camera and imaging spectrometer and a second carries a mass spectrometer. Traditional planetary spacecraft have also carried dual copies of most critical systems so that if one fails, the spacecraft can continue operating on the second. To keep mass and per spacecraft costs low, the concepts presented at the conference envisioned a single copy of each system. Would risk management be better preserved by duplicating key systems within a single spacecraft or by flying two copies of the spacecraft? For the Centaur mission concept, the mission architects suggest that two craft could be targeted to the high priority Chiron object and the other two craft could be targeted to separate objects. If all craft succeed, three objects are visited. If half fail, you would likely get Chiron and/or flybys of two different Centaur objects. The Centaur mission presentation had one slide that suggests that building planetary spacecraft on tiny budgets only addresses part of the costs of a planetary mission. The team estimated that the total mission cost would be $511M, only 20% of which would be for four copies of the spacecraft hardware. (The design exercise was trying to hit the mission costs for a Discovery-class mission (~$500M in the future), rather than hitting a lower cost target.) The rest of the costs were for design, testing, launch, mission operations, and budget reserves. 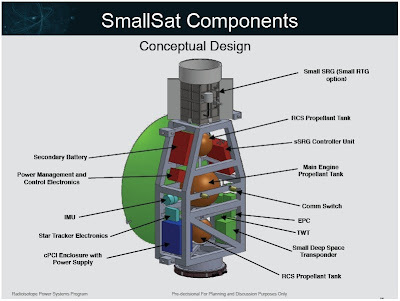 At the conference, presenters suggested that total mission costs for an inner solar system SmallSat-scale mission might be approximately $100M using a standard spacecraft designs such as the Micro Surveyor. If that target can be hit, the cost of the spacecraft hardware would represent 20% to 40% of the mission costs. At the moment, engineers and scientists are beginning to explore what might be accomplished by SmallSat-scale missions using today’s technology. As technology progresses, the potential for these spacecraft will grow. 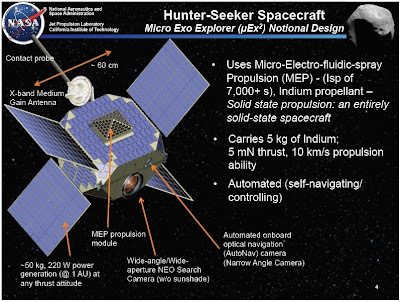 Another JPL team presented a concept for a near-Earth object hunter-seeker mission. This mission would use a next generation micro-electro-fluidic-spray propulsion technology. The spacecraft would first maneuver itself into an orbit just inside Earth’s orbit to begin a search for asteroids as small as a few meters across. As interesting objects are found, the spacecraft would rendezvous with five to six of them for close up examination by a camera and imaging spectrometer and with surface contact to probe the asteroids structural cohesion. Total mass for the spacecraft with fuel is estimated to be just 50 kilograms within a body (not counting solar panels) just 60 centimeters on a side. Conceptual design for a next generation SmallSat spacecraft for the near-Earth asteroid Hunter-Seeker mission. Credit: JPL. Editorial Thoughts: SmallSats for planetary exploration are an exciting concept, especially when NASA’s planetary program faces tight budgets for new missions. As I’ve tried to emphasize, though, they would complement, not replace larger missions. The goals for many planetary missions need multiple instruments that each would approach or break the limits for a SmallSat. The Mars MAVEN Discovery mission, for example, requires the simultaneous operation of a suite of instruments that together have a mass several times what a Micro Surveyer spacecraft could carry to understand the composition and processes in the upper atmosphere. The HiRise camera on board the Mars Reconnaissance Orbiter has a mass of 64 kg, approaching the mass for an entire Micro Surveyor spacecraft (~75 kg). However, SmallSats are promising to carry out highly focused investigations with smaller instruments or to visit objects that wouldn’t make the cut for $500M to $1B missions. Planeatary SmallSat missions could also provide opportunities for a new generation of scientists and engineers to take lead positions on smaller missions and gain the experience necessary to manager larger projects. Currently, the pool of scientists and engineers with flight mission experience who can take lead positions for future Discovery and New Frontiers missions is shrinking as flight opportunities have dwindled. For approximately half the cost of a Discovery mission with launch, NASA could fly two to three SmallSat-class missions. I hope that NASA pursues the opportunity. I expect that the planetary science community would show considerable creativity in finding ways to use missions in this class.